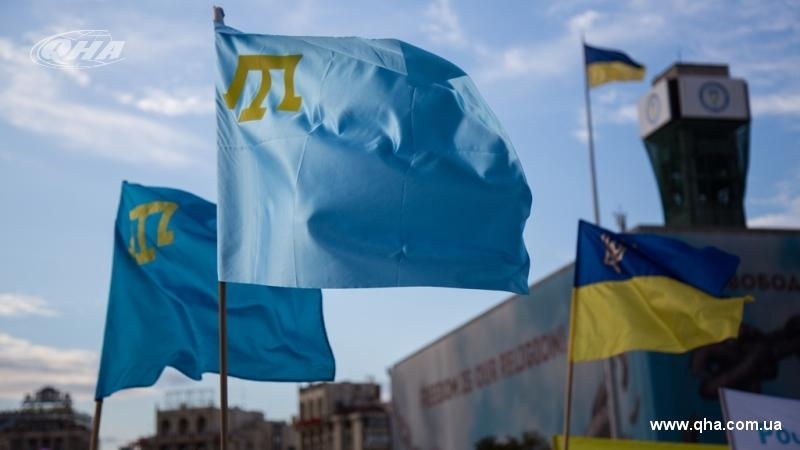 In 1991, the Qurultay of the Crimean Tatar people signed a decree "On the National Flag and the National Anthem of the Crimean Tatar People"
June 26 Ukraine is celebrating the Day of the Crimean Tatar flag. On this day in 1991, in Simferopol, the Qurultay of the Crimean Tatar people (the highest representative body of the Crimean Tatars) resumed its activities. Chairman of the Mejlis of the Crimean Tatar people Refat Chubarov noted on his Facebook page that one of the first resolutions of the Qurultay renewal was a decree "On the national flag and national anthem of the Crimean Tatar people". Chubarov stressed that the Crimean Tatar flag symbolizes the loyalty of the Crimean Tatars to the Crimea, as well as "steadfastness and commitment in restoring the rights of the indigenous people of the Crimea, adherence to the principles of peace, justice and good neighborliness in the arrangement of the Crimea." President of Ukraine Petro Poroshenko on his Facebook page congratulated Crimean Tatars and Ukrainians on the Day of the Crimean Tatar Flag. QHA reported that on the Day of the Crimean Tatar flag an auto rally and a procession to the Independence Square will be held in Kyiv. After that, a rally is planned in the center of the Ukrainian capital.